I was about 10 years old when I first set foot on a sailboat (Optimist) but that was nothing serious. However, I only started sailing more seriously in 2012 (when I was 14). That was the year when I got introduced to the Laser and competed in my first ever sailing regatta. When my family moved to lake Balaton I started going to a primary school which was quite close to a sailing club. The club (THE-name of the club) started an after-school activity where you had trainings on every Tuesday and Thursday during school time. My dad signed me and my sisters up and we were all enjoying the trainings a lot. It was great fun! The first boat I ever sailed was an Optimist but my first own boat was a 420 which I got from my grandparents. I chose the Laser because I wanted to start competing and it didn’t really work out in the 420 as I couldn’t find anyone to sail with. At the beginning of 2012, I still didn’t know what a Laser was, the only thing I knew about it was that it’s sailed by one person. (No one is sailing in my family so we didn’t know anything about the sport.) I still remember my first training in the boat (it was a very very old boat with old control systems but of course I didn’t know this at that time). The first time I sailed the Laser was March 31st, 2012 and I am in love with the boat ever since. 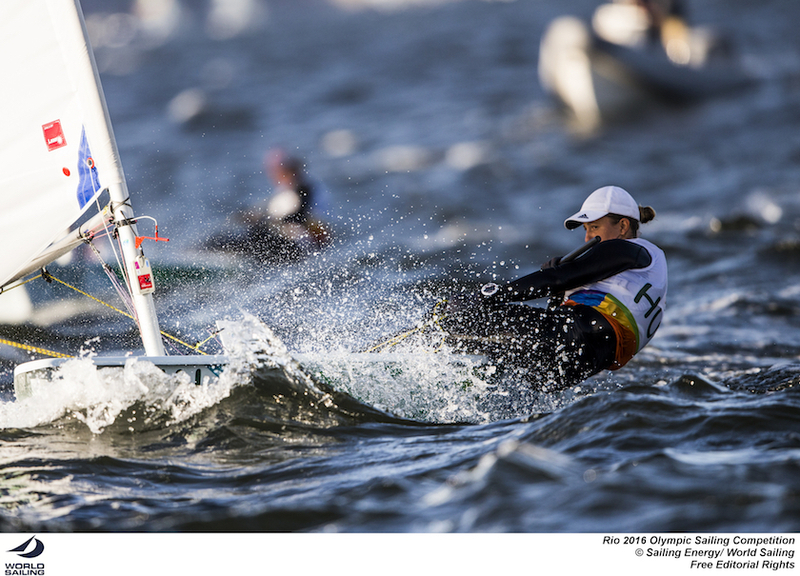 You sailed in two Laser Radial Youth World Championships (2014 and 2015) finishing second and then first. Were you at all surprised by that level of early success? I wouldn’t say that I was surprised. I was rather excited especially in 2014. I remember sitting in 5th position with two days to go and I was wishing that the regatta would finish there because I didn’t wanna lose my 5th place at the worlds… Everything happened really quickly in my sailing career and some of it I still can’t believe that it actually happened. I often don’t realize how big of a deal it is what I have achieved. In 2016, you represented Hungary in the Olympic games in Rio. You were one of the youngest competitors in the Radial fleet (perhaps THE youngest?). Do you recall what your expectations were going into the event? At the beginning of 2016, Rio seemed like an impossible target for me but when I qualified I slowly started thinking more and more about the result there. I was telling everyone that my goal is a top 20 finish but I was a little bit disappointed when I didn’t make the medal race… I had a good chance to make it still before the last fleet race but unfortunately, I had a horrible start which I couldn’t recover from so I missed out on the medal race by 4 places. I guess I am a little bit impatient :). How nervous were you at the start of Olympic competition and did that change over the course of the event? That’s a funny thing. I wasn’t nervous enough on the first day. Everyone was telling me not to be nervous and that the biggest mistake you can make is being too nervous and trying to do something special so I was extra calm and relaxed on the first day which didn’t really help me in the tight situations like mark roundings. I remember the first downwind gate where I let 10 boats go just because they were screaming at me…:D After that day I realized that being calm doesn’t mean that I don’t have to clarify who has room on who before I go around the mark. Was it different from other competitions or mostly the same once you started sailing? It was definitely not the same. The Olympics is the regatta that everyone is preparing for for years so just this one thing makes it special. Everyone is trying to prove what they are capable of in that week so no one is really joking around in the boat park. (At least not in the Laser Radial fleet. :)) Also, it’s much more organised than any other event and you are being treated like a superstar. On the water, everyone is super focused at all times and racing is super tight. Did you meet or exceed your expectations in Rio? 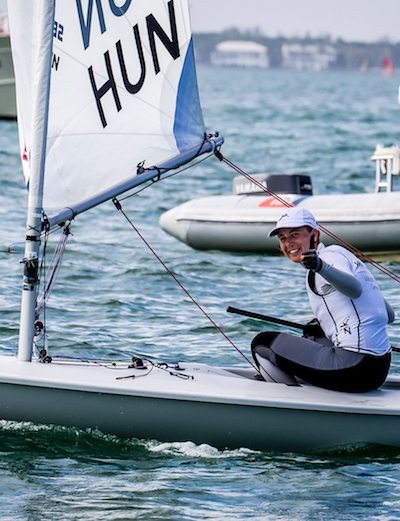 My goal was to come top 20 and I finished 14th at the end which is a great result for an 18-year-old sailor who started competing 4 years before the Olympics. But as I said before I really wanted to make the medal race and it was a bit frustrating when I missed out by such a little bit. How did it feel to win a race there? What do you feel was the most important experience you were able to take away from the competition in Rio? I think the most important thing I learned was how to approach the Games. I am sure this will help me in Tokyo. 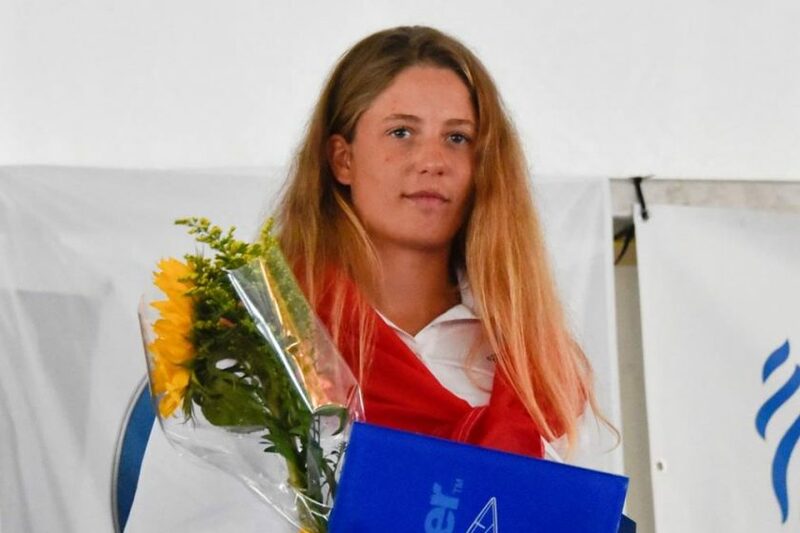 In 2017 you won a second Laser World Championship, this time in the Under-21 Radial Women’s fleet, with a fairly dominating performance, winning 6 of the 10 races sailed. When you come away from a performance like that, are you more focused on what you are doing right, or are you more concerned with what didn’t go well? I am the person who is all about the mistakes. If I do something wrong I will be thinking about it for months. Obviously, I didn’t do too many mistakes at the U21 Worlds in Belgium so I didn’t have too much to worry about after it was over. I also didn’t have too much time to think about it because the open worlds in Medemblik were just around the corner and I really wanted to do well there. You just completed the 2018 Miami World Cup regatta with a strong performance in the final four races to finish fourth overall. How much more difficult is the competition now in sailing against all age levels in the Radial? Sailing in the open fleet is really challenging and it’s unlikely that you’re gonna get away with the mistakes which might not cost you much in the youth fleet. This is what makes the racing so exciting and makes a good result so valuable. Miami was a great regatta for me because I saw how much my speed improved in strong winds but I still got loads of work to do before the next Olympics. I think that the Radial fleet is becoming more and more competitive so it’s getting more and more difficult to find that little edge that will make you win the regatta. There are a few things that we’re working on at the moment but my biggest goal for this year is qualifying Hungary for the Olympic Games which means that I need a good result at the Worlds in Aarhus. This shouldn’t be a problem as I’m aiming for a much better result than the worst qualifying spot. What do you feel are your strengths in sailing? (boat speed, starting, downwind, etc)? Luckily my boat speed is quite good in all conditions, especially in strong winds and I guess I’m quite good at reading the shifts most of the time. What are the areas where you feel like you can make the most improvement? I easily get confused in light winds when the speeds are nearly the same and I’m not sure about which side is gonna pay off. I usually try to win every race but I need to learn that on these ‘blurry’ days when no one really knows what’s going on you just need to have a good average. If I’m not sailing I still like to be active. Of course, I also enjoy laying around all day and do nothing sometimes but I get bored of it quite quickly. I love spending time with my family (I’ve got 4 siblings), I love cycling, discovering nature, playing squash, watching movies, listening to good music, etc… I hate being alone but as long as there is someone around me I enjoy almost everything I do. In a video made by ISAF there was a moment when you were at the piano? How well do you play? Do you have any favorite pieces or composers? I used to play the piano for 8 years and at one point my mum wanted me to become a pianist so I guess I was ok. Now I only play it for fun and not very often. My favourite piece is The Entertainer by Scott Joplin. 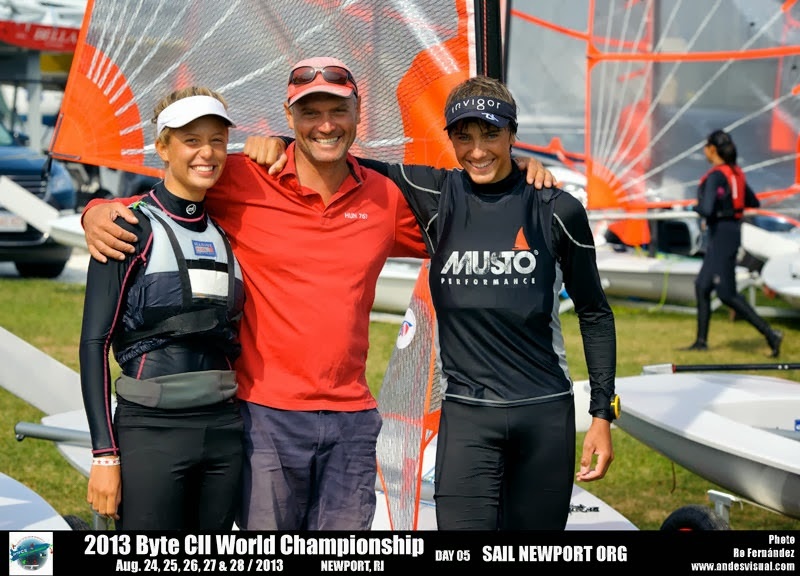 How do you balance sailing and education? And what are you studying? So the story with my education is a big question now. Last year when I was applying to universities I applied to one (actually my sister Julia did my applications for me as I was racing in Hyeres at the World Cup at that time) where I didn’t really expect to get in as you needed really high points to get accepted. Anyways, my final exams went so well that I got into the school (psychology major) and started going in September. It was going well at the beginning because I had time off from sailing but then my winter trainings started and I was never home so I had to let it go. I love sailing way more than psychology so it was a fairly easy decision. Now I am looking for an easier course. At the moment I am really focused on my sailing and I don’t really have anything that interests me as much as sailing does. My biggest goal outside sailing right now is to find a university or course which I can complete without harming my sporting career. 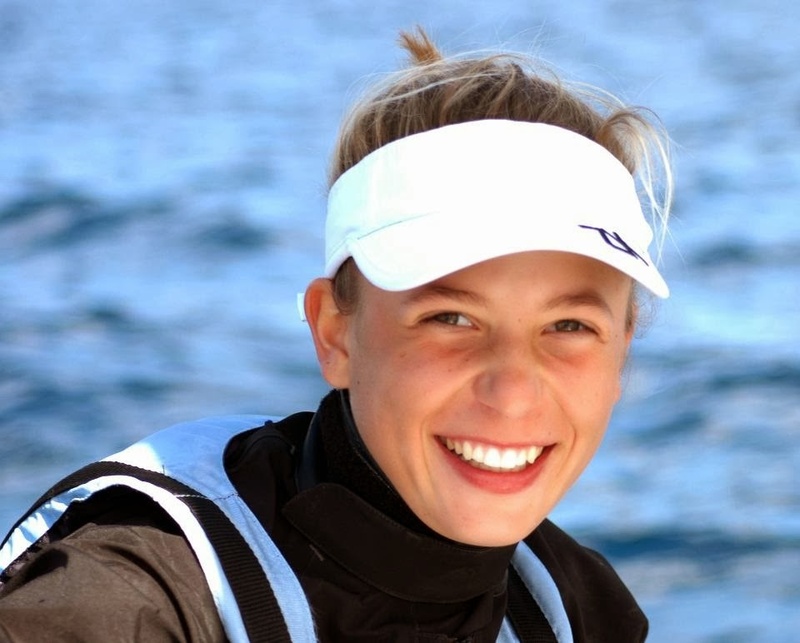 There is another sailor from Hungary, Jonatan Vadnai, who sails the Standard Rig and is your age and also sailing at a very high level (finished 2nd in the 2017 Under-21 Worlds and 1st in 2016). Did you know or sail around Jonatan as you were learning to sail? Or did you meet much later? I met Jonatan when I started sailing the laser and we spent quite some time training and racing together while he was still in the 4.7 and the Radial. We also went to the Youth Olympic Games together and shared many victories. When you go to the worlds and there is one Hungarian boy and one Hungarian girl in the whole fleet and they both win, that’s a really special feeling. Do you and Jonatan have any shared history other than being from the same country and both sailing a Laser? (Do you have the same coach? Do you train at the same place? etc). Hell yeah! 🙂 Jonatan and I used to go to the same school and sail at the same club, placed in Balatonfured. We would often go out to train together after school which I think was great for the both of us. This wasn’t for a very long time though, I went to a different school and club at the end of 2013. 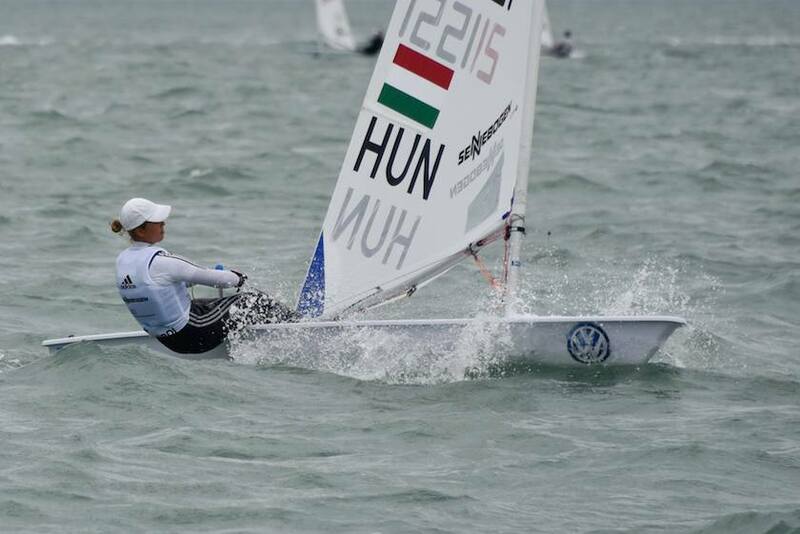 It is interesting that Hungary has produced two top Laser sailors of the same age at the same moment in time. Is that just random chance? Was there a great youth program at the time? Or is there something in the drinking water?! I think that the biggest part is that we were both living at the lake and we could go sailing every day. We both loved the sport so we improved quickly. The other big factor is to have the crazy parents who would buy us boats and send us training and racing abroad just because we were enjoying it so much. What would you like readers to know about Mária Érdi as a person? You don’t like working out at the gym? Are there particular exercises you dislike? Or do you just want to get out of the gym and go sailing? Yeah… when I am at the gym I’d much rather be sailing or cycling. I prefer the cardio training much more. How do you get motivated for training at the gym? Well, I just start the training and I get motivated along the way. I like to do a 30-minute warm-up every morning on racing days. It wakes me up and prepares my body and mind for the big day.